Use these 3 Law of Attraction techniques for manifesting what you want! When you learn to talk to the Universe correctly, you can manifest ANYTHING you want. Talk to the universe using these three law of attraction techniques for manifesting what you want. When you learn how to talk to the universe correctly, you can manifest anything that you want. Let’s dive right into this video. 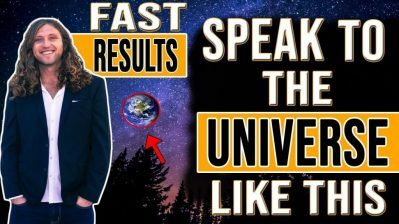 Number one on how to talk to the universe and to talk to the universe, you must eliminate time. You must eliminate time because science tells us that energy is never created or destroyed, so what does that mean? That all the energy that ever was and ever will be, all the realities that ever was and ever will be, because all reality is is a conglomeration of energy. It’s just energy. It all already exists, so what does that mean? That everything that you want already exists, but as long as you say, I hope this thing comes in the future, it’d be great at this thing. Shows up. What you’re really doing is having a consciousness in this moment that implies the absence of what you want. Now your subconscious mind is how you directly communicate with the universe and your subconscious mind doesn’t know the difference between what’s real and what’s not real. It has no idea. Your conscious mind might say, I really hope this thing occurs or I’m so grateful that money showing up in my life or anything like that. It could say one side of the coin or the other because everything is really two things. The presence of what you want or the absence of what you want, and you may say, well, how do I. How do I pretend what I want already exists? It’s a you must understand. The subconscious doesn’t know the difference between what’s real and what’s not real. So when you’re wanting love to show up in your life and you constantly say that there’s no good guys left or you say, I can’t possibly find the woman of my dreams, it hasn’t worked out the last seven times. What you’re really doing is telling the subconscious mind, no love blocking love, no love. There is no love. Your subconscious doesn’t know what you really want. It just receives the essence of what you’re saying and that’s how you program your subconscious. So the subconscious is always being program and the subconscious is your direct access to the universal mind. Now, when you program that universal mind through your subconscious, that’s what shows up in your life, and so forget about time entirely and start affirming that what you want already exists, something like this. I am so grateful that God’s abundance flows into my life in avalanches of abundance. What I want is here now. I’m so excited about life and all that it has to offer. Thank you universe for attracting love into my life. Whatever it is that you want. That’s how you talk to the universe as if it already exists. You think of the universe in the same way that you think of any other type of relationship that you’re wanting to build. So when you’re, when you’re with your partner, when you’re with your friend, when you worth of relationship that you’re wanting to build you, you always talk about it in the present.